An LP identified as a carrier of SCP-2112. Special Containment Procedures: Due to its cultural significance and the period of time elapsed between its creation and the discovery of SCP-2112, full eradication of SCP-2112's primary carrier is impossible at this time. The Foundation shall liaise with the management of Rush and with any relevant record labels to prevent any future production of SCP-2112-carrying sound recordings. All known sound recordings carrying SCP-2112 are to be seized by the Foundation and archived or destroyed as deemed necessary, and information regarding the release of affected editions is to be removed from public information archives where possible. Foundation field personnel are to monitor stores selling used LPs or compact discs, online auction houses and used goods sellers, and digital distribution services for any appearance of SCP-2112 carriers. The Foundation shall monitor all public performances by bands advertising themselves with any variation on the phrase "A Tribute to Rush", or with a name referencing the lyrics of any Rush song, for evidence of SCP-2112 infection. Any identified SCP-2112 infectees are to be detained, interviewed to identify the source of infection, and treated with Class-B amnestics. In the event of a wide-spread outbreak of SCP-2112, large-scale deployment of Class-E amnestics is authorized. 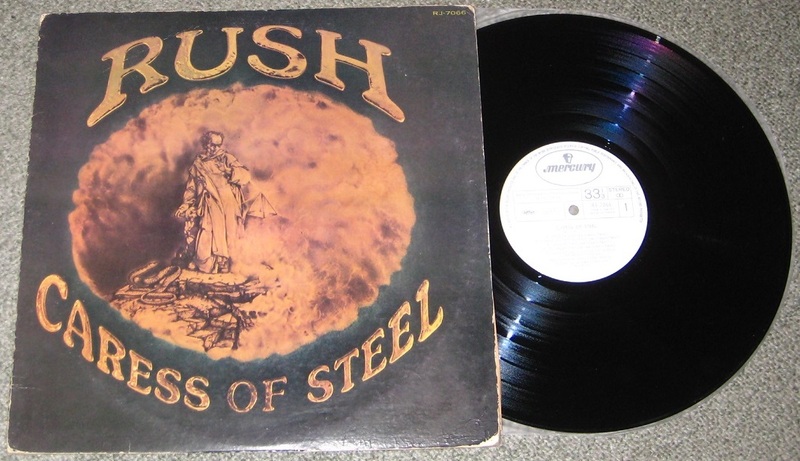 Personnel with an expressed fondness for the music of Rush are prohibited from exposure to SCP-2112 materials and are to be monitored for any behavior indicative of SCP-2112 infection. Description: SCP-2112 is a memetic phenomenon associated with Caress of Steel, a record album released in 1975 by the Canadian progressive rock band Rush. SCP-2112 is not present on the original master recordings or on most common commercial releases of the album, and is known to manifest only on three limited-release editions: a quadraphonic mix of the original LP issued in 1975, a digital remaster issued on SACD in 1999, and a high-fidelity remaster issued on LP in 2011. Reproductions or copies of affected discs do not produce SCP-2112 phenomena, and audial examination of affected discs has detected no distinguishable differences from non-anomalous recordings other than artifacts caused by the remixing/remastering process. SCP-2112's primary anomalous effect manifests when an affected disc is listened to, in its entirety, by a person who identifies him/herself as a fan of the music of Rush and possesses any level of experience in playing the electric guitar, electric bass, or drums. Exposed individuals will become obsessed with the idea of establishing a "tribute band" dedicated to performing cover versions of the music of Rush in public, regardless of their level of musical experience or current occupation or membership in other bands, and will attempt to seek out two other SCP-2112 infectees for that purpose. SCP-2112 infectees have been noted to go to any lengths available to achieve this goal, including resigning from their job, relocating to another part of the world, selling off major possessions in order to acquire instruments or equipment, or deliberately exposing others to SCP-2112 in an attempt to create potential bandmates. In the event that three infectees are successful in establishing a group, they will begin to seek out any venue that will allow them to perform in public and will do so as often as possible, performing sets composed entirely of the music of Rush in their original arrangements. The music produced by SCP-2112 infectees during live performances additionally serves to propagate SCP-2112 to any persons exposed to it. In this form, transmission of SCP-2112 occurs much more readily than in persons exposed to the source discs, with any person who identifies as a fan of the music of Rush potentially becoming infected, whether or not they possess any musical skill, after approximately 15-20 minutes of exposure. Testing with D-Class personnel indicated that even individuals with no prior familiarity with Rush and only a rudimentary level of skill with any musical instrument have a 70% chance of becoming infected after approximately 2 hours of exposure to live performances by SCP-2112 infectees. Post-infection behavior in such individuals is identical to that of persons infected by exposure to the source discs. SCP-2112 came to the Foundation's attention on ██/██/1982, when an hour-long nightly news broadcast produced by television station W███ in Portland, ME was observed to consist entirely of three of the network's broadcast personnel, identifying themselves as "By-Tor and the Snow Dogs", performing a live rendition of Rush's 1981 album Moving Pictures. The overwhelming majority of commercials aired during the broadcast, rather than advertising any product or service, additionally portrayed various local businessmen and politicians performing fragments of Rush songs with varying degrees of skill. Upon investigation, it was found that a performance by a trio of infectees, broadcast on local radio station W███ five days earlier, had caused a rapid spread of SCP-2112 infection throughout the Portland metro area, and that approximately 73% of the region's live music venues had booked Rush tribute bands to perform the following night. Implementation of Procedure Wertham-673, followed by aerial dispersal of Class-E amnestics throughout the area, was deemed necessary to prevent further spread; current models indicate that, in the event of an unchecked SCP-2112 outbreak, the phenomenon would reach pandemic status within three weeks of the formation of the first tribute band. The members of Rush, in interviews conducted by the Foundation, have claimed no knowledge of or involvement in the creation of SCP-2112. Some have questioned why SCP-2112 warrants classification as Keter. It is true that SCP-2112 poses no direct threat to human life or the continued existence of the human race; were every person susceptible to SCP-2112 infection to be infected, it would likely not result in a single fatality. What it does present, however, is a severe existential threat to the entirety of human culture, the arts, and all forms of creative work whatsoever. Man is a wonderfully creative animal and has developed a myriad of ways of expressing his thoughts and emotions - through poetry, dance, film, the written word, theatre, painting, sculpture, video games, even internet memes. We run the risk of every one of these mediums - every single last one of them - disappearing from our common experience, forever, in favor of thousands and millions of mediocre everymen performing the exact same songs over and over again.